Had it not been a sample for my friend’s shop I would never have truly appreciated the great knit Goddess that Elizabeth Zimmermann is. I mean I did a bit with the Norwegian Mittens but now I’m a true loyal devotee. What a cool freakin’ pattern! I mean it was all knit stitches which at first I thought would make me be bored to tears BUT NO! I was enthralled up to the last bit of I-cord. Oh sure, The beautiful colorway of Manos 113 also helps. I knew from the cast on that a gold border would just pull it together and boy, it really did! However it was so easy to change your mind to a pink or a blue border because the colors in that yarn just allow so much creativity. Of course knitting this jacket in a little over 7 days would not have entirely been possible without me being off from work. (although we all know what happened when HP came out – a girl’s gotta read too you know!) I also decided against making the hood because I just loved the the look of the ‘popped collar’ – it’s the Jcrew prepster in me. The applied I-cord was a first time for me. I couldn’t quite picture the concept at first but once I got it going there was no turning back. I’m surprised I haven’t i-corded the couch cushions yet! Also a huge thanks to J a r e d for posting his gorgeous adult version which sparked the inspiration. This humble knitter truly wonders where she would be without the knit blogs… they have proven time again to be such a source of energy, inspiration and support! Thank you a million times over. The popped collar was the way to go, it give it such a fresh touch. I agree that knitting blogs do provide so much inspiration and many useful ideas! Sometimes I forget that that is the reason I read them. Adorable – the Tomten and the children! You are one of those who inspires, so thank you! Have a great week on LBI. My girls are there with their grandmother right now. FANTASTIC! What a fabulous knit! I love it! Very cute! I really love all the color variation in the main color. SO cute! The colors of this jacket are my favorite I think. And looks like you found the perfect model too–I don’t think she could be any cuter. I’m speechless, it’s so freaking sweet. Well said. I also have found the knit blogs have taken my hobby to a new dimension. BTW, how’s the sewing up on Cherry? I can’t wait to see how that finished! Hi! 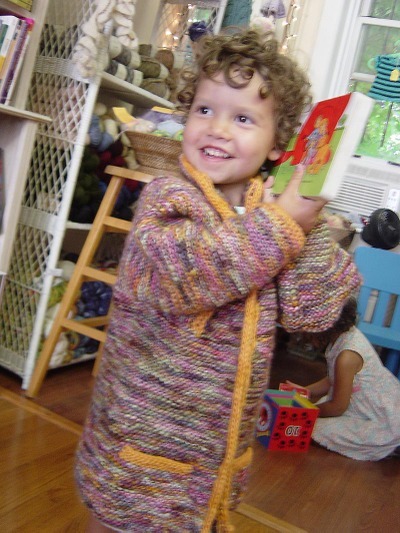 I found your blog through ravelry, I love your tomten, it’s the coolest one for kids I’ve seen yet! That is so very cool! Fantastic job! Rockin’! Between Cobblestone and Biscuit’s Denim Blanket, I don’t know when I’m gonna do this, but it’s going to be SOOOON. Use of lolly as bribe is noted- I do that all the time these days. I have a big ole stash of Dum-Dums in my diaper bag. The I cord contrast really sets off the Manos, good choice. 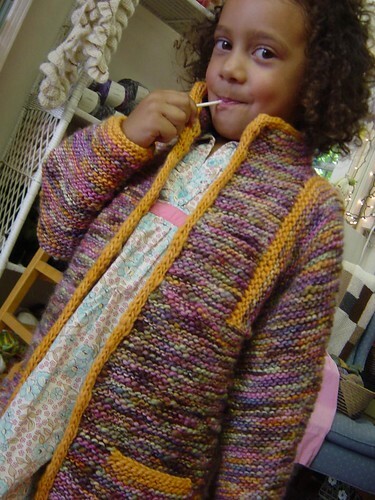 Did you use an EZ original pattern or did you find an updated one somewhere? I think the EZ books make entertaining and educational bathroom reading, but they kill me when it comes to following the pattern. So, so cute! I love, love, love the colorway of that Manos, and it looks great with the contrast action going on. That is too cute! The jacket looks almost too perfect on your model, did you managed to get it back?! that came out wonderful – the color you picked for the binding couldn’t have been any better!!!! Wow, great jacket! I love the colors and the popped collar. Hi there! I love your tomten! I’m knitting one right now and I’m hoping you can help me. The pattern says to work a short RIDGE. Does that mean that two rows need to be short rows, or does it mean a short row and then a regular row? If you could advise, I would really appreciate it! Thanks.